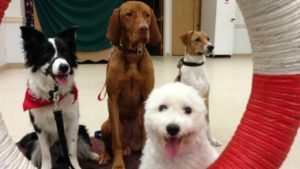 The Dog Market’s Dog training in Toronto is provided by Dorothy, Chief Instructor at Mother Knows Best Obedience School. Through strictly humane methods, Dorothy has been teaching obedience for 25 years and is a very successful dog behaviourist in Toronto. Dorothy focuses on kindness and working with the dog’s natural spirit to encourage positive behaviour modification. Training and obedience are achieved without food or treat coercion, resulting in an increase in bonding and a willingness to please. Puppy school also enhances puppy socialization as they will have the chance to interact with other dogs through group classes. Build a better relationship with your dog through humane obedience training. Your relationship with your dog. Plus, in our experience, better behaviour from your dog can also improve other relationships in your life. As long as your dog is up to date with vaccinations, there’s a space for you in one of our regular puppy school group classes. Just be sure to bring your sense of humour! Walk without pulling the leash. Sit when you stop walking. Stay, sit, and come when called to sit in front of you. Ignore unattended food on the table (since it is not for him/her). Ignore the door (after all, the doorbell is not the enemy). Stop jumping up on visitors and furniture. Be polite. We emphasize proper puppy socialization with other dogs. 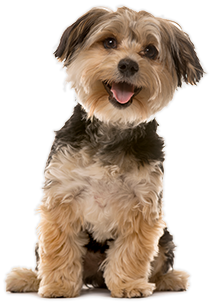 You’ll be amazed at how quickly your dog learns with a qualified dog trainer. And the best part is that it’s fun for both of you! Q. HOW OFTEN DO CLASSES RUN? A. Monday and Friday, all year. Classes start at 6 pm, 7 pm and 8 pm, and run for 6 weeks once you start. Q. HOW MANY DOG/OWNER PAIRS PER CLASS? A. 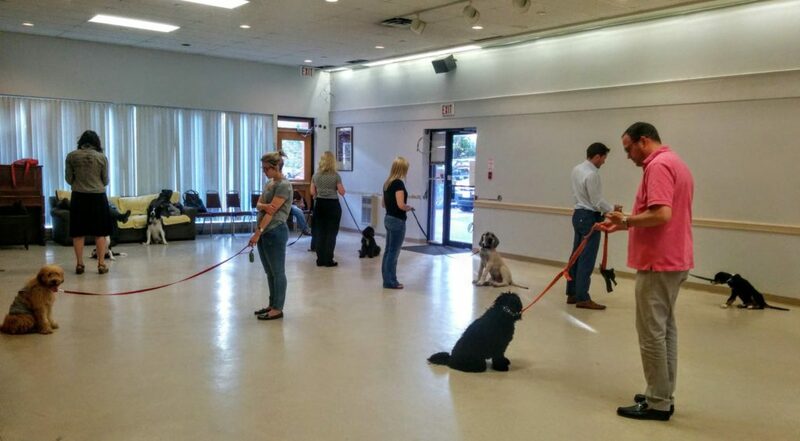 Each class accommodates up to 6 pairs (parent and pet), but smaller class sizes are common. Q. ARE THERE DIFFERENT TRAINING LEVELS? A. Yes! We recommend most start in the level 1 class, which teaches fundamentals like sit, stay, heel and general behaviour cues. Once your dog completes level 1, you can move on to level 2 for more advanced training, including hand signals and distance training (like recalling from out of sight). There’s more too. We don’t want to get ahead of ourselves. So, all we’ll say is – agility training. Whatever your breed or your level of experience, obedience training is a fun, smart way to bond with your dog. Q. HOW DOES YOUR PUPPY CHANGE IN THE FIRST YEAR? Birth to four weeks of age: Puppies are becoming used to their surroundings, opening their eyes and developing baby teeth. During this time puppies need to be kept warm and given access to proper nutrition from their mother. Four weeks of age to three months: Typically, puppies are able to go home with their new owners when they are eight weeks old. They will have developed basic motor skills and be used to some socialization. During the first three weeks at home, your puppy may understand some basic training but will focus on becoming used to you and their new surroundings. Three to six months: During this period is when puppies are most impressionable. They will have developed the mental capacity to interact with you and may start to test their limits. It is critical that you work hard to create a positive relationship with your pet and train them during this time. Beyond six months: Your puppy is growing up faster than you would like at this point! From here, you can continue training your dog and should start to settle into a regular routine to reinforce the positive behaviour you would like them to take on. Contact us now or stop by the shop to schedule your obedience training with our expert dog trainers. You’re going to have a great time!